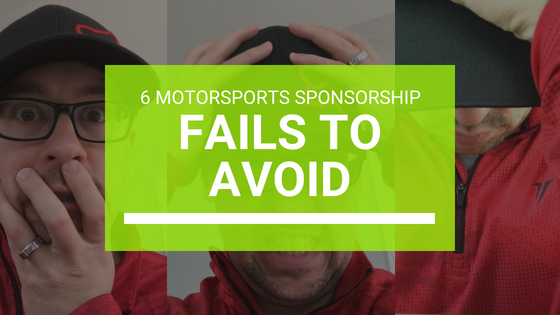 Have you ever worried about making a fool of yourself while trying to secure a sponsor in the motorsports industry? Well…join the club. Lucky for you, a lot of people have done this before and have shared their experiences so that YOU don’t have to repeat their mistakes. The best-case scenario is that you are already using their product, and you can share your positive experience with them. Your goal initially is sparking a conversation and forming a relationship. You will build to a proposal over time. Although spelling, punctuation, and complete sentences may be lacking on some social media platforms (yeah you Twitter), it is very important for written sponsorship proposals. When communicating with sponsors, check your grammar and ensure you are sending a clear message. This will send the signal that you are professional, mature, and thorough. I recommend using Grammarly (https://app.grammarly.com/) to assist with this, as it will check your grammar in the background on web applications and make recommendations. Another option is to write your proposal in a word processor, check for spelling, then copy/paste into the appropriate platform. Oh, and PLEASE spell “sponsor” correctly. Sponor, sponcer, and sponser do not work. Please use copy/past wisely. If you are putting together a ton of sponsor proposals at the same time, it can be efficient to copy/paste your text. That is fine, just make sure you change the name! To avoid this, begin with a template and use the term [SPONSOR] highlighted in each section where you mention the company’s name. Also, make sure you update the specific characteristics of the company that you admire (as discussed earlier). It would be very embarrassing to tell GoPro that how much you love the durability of their gloves that you have been wearing for years. Avoid pursuing sponsors that compete against each other. Sometimes this is extremely obvious, and other times it is much more difficult. For example, if you are sponsored by Redbull, you are probably NOT going to pursue a sponsorship with Monster as they are obvious competitors. However, if you are sponsored by a part supplier like SuperATV.com, you should not pursue Gorilla Axles, because SuperATV.com sells Rhino Brand axles, which compete against Gorilla Axles. This competition is not as obvious, and requires some research and thought. By doing the work up front though, you can avoid a very uncomfortable conversation with your sponsor, or even a sponsorship termination. I know that video of your buddy doing a keg stand is pretty gnarly, but your followers, and especially your sponsors, do not want to see that crap. Keep your posts mature and relevant to your audience. If you want to share that type of information, do so on a personal social media platform that your followers and sponsors cannot see. These things take time. If you are successful and gain a 10% discount sponsorship in you first year of racing or riding, please use that opportunity as a stepping stone for building a relationship. Over time (typically measured in years) you will build trust with that sponsor, and it could lead to HUGE discounts and even cash deals. For a steady stream of motorsports marketing and sponsorship advice, subscribe to the Sponsored Rider Club Podcast found on iTunes, Google Play Music, iHeartRadio, or at impactfuel.libsyn.com.